Last weekend my husband and I took a trip out to visit his mother. She lives just south of Sedona, Arizona. Of course, this meant that I was able to visit one of my favorite fabric stores - Quilter's Store Sedona and Gallery. That's my husband with the sign. The owners don't allow photos inside the store but it has a most wonderful collection of batiks. 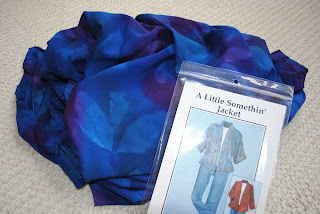 I was delighted to find some rayon batik fabric and a pattern for a jacket that I really liked. There was even a sample made in the store that I could try on. Here is a peek at the fabric. The pattern is really simple and despite some heavy traveling and other commitments, I can't wait to start sewing it. There is a gallery associated with the store and they had an exhibit by Margaret Anderson which is still on display until March 31. I really enjoyed seeing Margaret's works which are explained as dyed fabric that is cut and then pieced into a composition. 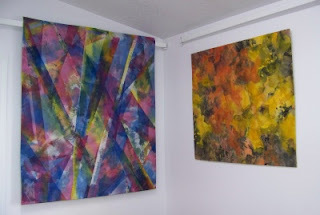 Here is a photo from the store's website of two of Margaret's works. That jacket looks comfy and classy as well as casual, Judy. I'll bet you enjoy making it. As for the artwork -- stunning! I've been dyeing in my City & Guilds program -- just small pieces, mainly solids -- but now I'm inspired to play in a different direction. P.S. Can you tell me how the pieces were hung/mounted? I'm always on the look-out for good ideas in this area! Wonderful color for sewing...post the jacket when you are done so we can see it! Thanks for your comments. 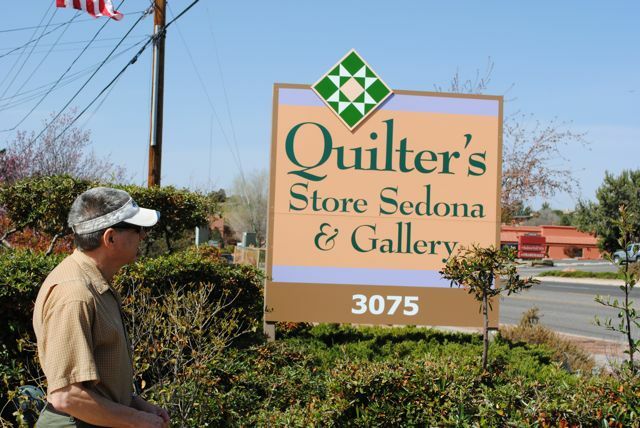 I think that the quilts were hung with sleeves. It looks like white strips of wood ran through the sleeves. The jacket is about half done. If I am lucky, I will finish it this week. Had to go to the city this weekend - see my next post.